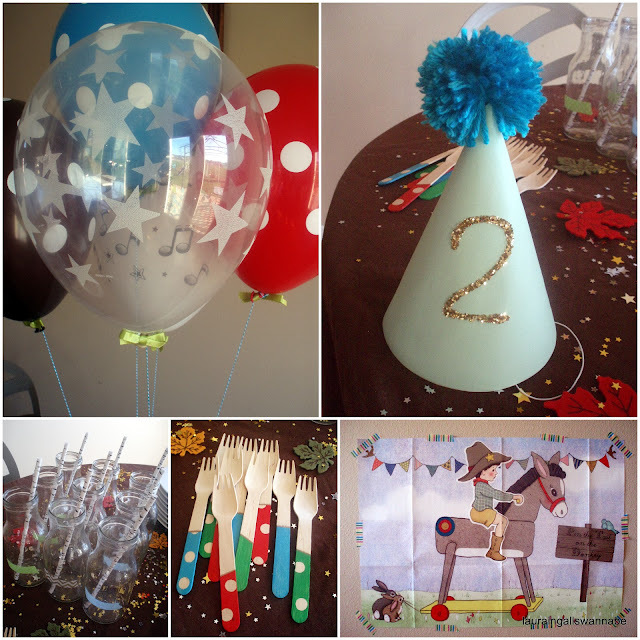 We celebrated Jamie's second birthday in November with a nature-inspired party. Our palette was bright red, robin's egg blue, greens, brown, and metallics. For the nature element, we brought in tons of stars and nodded toward this time of transition between autumn and winter with felt autumn leaf table scatter and a wintry cake. Since he's still so young and his birthday falls right in the thick of the holiday season, we kept things simple and focused on small, pretty details for the cake table. We had tons of party hats left over from Meg's party, so I turned one inside out, covered it in coordinating paper, glittered a number two, and added a yarn pom pom to the top. I like having a special party hat each year for the birthday child to wear in cake photos and later to tuck away in their memory boxes as a memento of the day. As has apparently become our tradition of sorts, the drinks were served in glass milk bottles. I used washi tape labels to mark names. The birch-look paper straws are Kikkerland. I purchased them from Amazon. I painted the wooden forks with food-safe soy paint. I taped off the straight lines with painters tape, and I used circle stickers to tape off the polka dots. I used a bronze Sharpie to add detail, but it bled a bit, so I would use a paint pen instead if I ever do it again. I folded the napkins using these simple instructions. I love a cheery bunch of balloons on the birthday child's chair. The balloons were secured with baker's twine and decorated with sweet satin bows. This year was a big deal for me, because it marked the first successful cake I've ever made. I am severely cake challenged, and every year I end up crying and swearing in the kitchen the morning of my kids' party, elbow-deep in batter and frosting, because I have no clue what I'm doing when it comes to baking. This year, I went with a simply decorated cake, and I searched the internet for tips on the baking and frosting before beginning. It's nothing special, really, but I couldn't be happier that it turned out just as I'd hoped it would. The trees are from Amazon, and I'll admit I wasn't crazy about how cheap they looked in person. The top of the cake was coated liberally in Wilton edible glitter stars. For entertainment, James spent a leisurely afternoon opening gifts while we all visited with family, and we all played this darling Belle and Boo version of Pin the Tail on the Donkey. And here's my beautiful big boy on his day. His Papa encouraged him to try this!